Coast Diamond presents Ganem Fine Jewelry of Phoenix, AZ as our featured retailer of the week. The first Ganem Fine Jewelry store opened its doors in 1982. George Ganem, a certified gemologist, had deep roots in the East Valley of Arizona and strengthened them with the opening of his 2,000 square foot store in Tempe. In 1998, as the demand for his services grew, George opened another 8,000 square foot Ganem Jewelry location in Ahwatukee, AZ, with a full service design and repair shop. If you desire a custom piece of jewelry this is where it all happens at Ganem’s. By 2002 the Ganem sons, Jason and Curtis, were ready to take the reigns from their dad, so he could pursue other interests. Their success led to the opening of Ganem Fine Jewelry in Scottsdale, AZ, in 2008. The Scottsdale store is another 4,000 square feet of fine jewelry and timepieces serving the northeast Phoenix area. You will feel the Ganem family’s love for the community when you enter their doors. Both locations are warm and inviting, and the service you receive makes shopping for the perfect Coast Diamond engagement ring an exciting and pressure-free experience. The following three Coast Diamond engagement rings are just a peek of what you will find at Ganem Fine Jewelry. Ganem Jewelers: Coast Diamond stunning round double halo wedding set (LC5445 & WC5445) with multiple rows of diamonds on the bands. Ganem Jewelers: Coast Diamond double halo engagement ring (LC10130) with a 1.25 CT center stone and a split shank of diamonds. Ganem Jewelers: Coast Diamond 1CT round center stone engagement ring (LC10291) with a twisted diamond shank. Congratulations Ganem Fine Jewelry for your excellent service to the Phoenix, AZ community and being our Coast Diamond Featured Retailer of the Week! Coast Diamond is pleased to announce Quenan’s Jewelers of Georgetown, TX as our featured retailer of the week. Steve Quenan grew up in his parents, Bill and Lill Quenan’s jewelry store, Quenan’s Jewelers, in Bastrap, Louisianna. He showed a gift for design and craftsmanship from a young age. This gift led Steve to participate in every chore within the store from sweeping the floors to educating customers about diamonds and gemstones. After graduating from Northeast Louisiana University with a degree in geology, Steve managed the Quenan’s store in Bastrap for 16 years. Seeking a change for his family, Steve and his wife, Kyra, found themselves in the warm and welcoming town of Georgetown, Texas in 1999. Georgetown was the perfect place to open a Quenan’s Jewelers, because Steve and Kyra had a service that would be appreciated by its tight knit community. Bill & Lill Quenan founded Quenan’s Jewelers of Bastrap, Louisiana in 1947 and were known for their charm and friendliness. Today, when you stop into Quenan’s you will be served by a staff with more than a century of combined service in the jewelry business. Whether it is an engagement ring for the perfect proposal, an eternity band for your lasting love, or an anniversary band to celebrate that special day when you said “I do”, you will find a gorgeous Coast Diamond ring to fit the occasion. Coast rings are all completely customizable for any shape or size center stone and any metal type, making each ring as unique as the person wearing it. Quenan’s Jewelers: Coast Diamond engagement ring (LC5449) with intertwining diamond band that meets to create a brilliant halo around the center stone. Quenan’s Jewelers: Coast Diamond elegant 1 CT oval halo engagement ring (LC10233) with delicate diamonds on the shoulders. Quenan’s Jewelers: Coast Diamond stackable wedding, anniversary and eternity bands available in white, yellow, and rose gold or platinum. Congratulations Quenan’s Jewelers of Georgetown, TX for being our Coast Diamond Featured Retailer of the Week! Coast Diamond Featured Retailer: John Greenan & Sons Fine Jewelry of Metro Washington D.C.
Coast Diamond is pleased to announce John Greenan & Sons, of the Metropolitan Washington D.C. area, as our featured retailer of the week. Dazzling diamonds are the passion of Coast Diamond as well. When you stop into Greenan & Sons you will find the most trendsetting Coast designs – rose gold settings, floral shapes, colored gemstones – for the fashionista bride. You will also find timeless Coast designs – 1 CT center stones, cushion-shaped halos, milgrain edging – for the classic bride. When buying a Coast Diamond designer engagement ring at John Greenan & Sons you are working with experts who can help you make any ring perfectly suited to you and your personal taste. How can you personalize a Coast Diamond engagement ring? Choosing the perfect center stone – diamond or gemstone – is a breeze with the help of a member of the Greenan & Sons family of knowledgeable staff members. John Greenan & Sons: Coast Diamond bold, round halo engagement ring (LC5344) with a three row diamond split shank. John Greenan & Sons: Coast Diamond beautifully classic, cushion-shaped halo engagement ring (LC5391) surrounded by fine pave diamonds. John Greenan & Sons: Coast Diamond 1 CT round center stone engagement ring (LC10129) surrounded by a cushion-shaped halo, paired with a sparkling diamond wedding band (WC10129). Congratulations John Greenan & Sons for being selected this week’s Coast Diamond Featured Retailer! 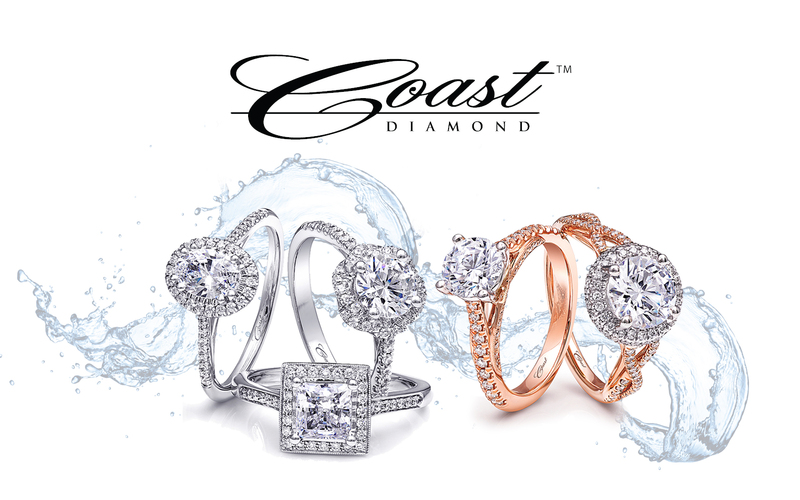 Coast Diamond presents Diamonds on Wabash of Chicago, IL as our featured retailer of the week. Diamonds on Wabash is located on Jewelers Row in the heart of Chicago… on Wabash Avenue, of course. They opened their doors in 1985 and have been providing fantastic customer service for over 30 years. We are impressed that you can start educating yourself on the finest cut, conflict-free diamonds right on the DOW website. Diamonds on Wabash provides you with a wealth of information, so you can feel empowered as a consumer when choosing a center stone for your dream Coast Diamond engagement ring. Did you know that each Coast engagement ring is completely customizable? Diamonds on Wabash can help you choose any shape or size center stone and any metal type to create a ring as unique as the person wearing it. Coast Diamond by Jay Gilbert has collections from subtle to sophisticated. The Coast Rose Gold Collection has brilliant diamonds set in warm rose gold, like the Coast engagement ring above. Rose gold is a very popular bridal jewelry trend that we think will be around for quite a while. The Coast Charisma Collection contains some of our most popular engagement rings, because of their exquisite craftsmanship and timeless designs. Feast your eyes on these gorgeous Coast Charisma Collection engagement rings and wedding sets available at Diamonds on Wabash. Diamonds on Wabash: Coast Diamond cushion-shaped halo engagement ring (LC5356) with wire trim, paired with a matching wedding band (WC5356). Diamonds on Wabash: Coast Diamond timeless round halo engagement ring (LC5448) with a 1 CT center stone. Diamonds on Wabash: Coast Diamond stunning 2 CT, double-prong center stone engagement ring (LC10043) with marquise-shaped open shank and matching wedding band (WC10043). Congratulations to Diamonds on Wabash of Chicago, IL for being selected Coast Diamond’s featured retailer of the week!